Moving time: 4 hr 31 min. Wind: 10 mph south wind (head) during last 20 miles. Otherwise light, variable breezes. Today was another smooth day of riding although the hills were a little steeper than yesterday. I'm in a section called The Knobs which surrounds the bluegrass region. I passed by the Abbey of Our Lady of Gethsamane, a Trappist monastery where the monks support themselves by making cheese and fruitcake. It is supposed to be the best mail order fruitcake available but that's relativeit's still just fruitcake. People play a lot of mailbox baseball around here. I've seen very few metal mailboxes that are not bashed in or have the door ripped or blown off. There are a few things people do to keep this from happening. A lot of people build a substantial concrete or brick pillar into which they set the mailbox. Other people buy those plastic mailboxes and stands. Some people even build their own mailboxes out of substantial plate steel. In previous days the pastures were dominated by cattle but today I saw all variety of horses, donkeys and mules. People make a good business of raising and boarding horses it seems. I also saw lots and lots of hay being cut, baled and hauled down roads. Bardstown was a very nice place to see. It is the town in which Steven Foster wrote his famous song, My Old Kentucky Home. There is a very famous musical that occurs here daily that I cannot make (need to keep pedaling). 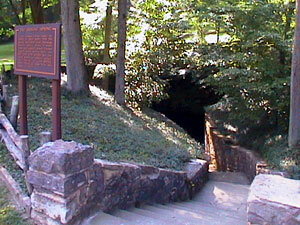 Some day I'll return to see it and visit the town and My Old Kentucky Home State Park. They do have a nice McDonald's here. Bardstown is also in the center of a region of some famous distilleries. 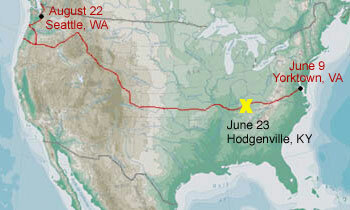 There are some very famous bourbons and whiskeys distilled in the nearby towns but they are off route and I'm not terribly interested in visiting any of them. Bardstown was once home to 22 distilleries but now only four remain - Jim Beam, Maker's Mark, and Heaven Hill. Many of the old buildings remain to this day. Just west of town I rode through an area where they have giant silver sheds where bourbon is aging in huge casks. 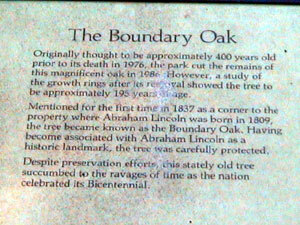 The day ended at the Abraham Lincoln Birthplace National Historic Site which is run by the National Park Service. 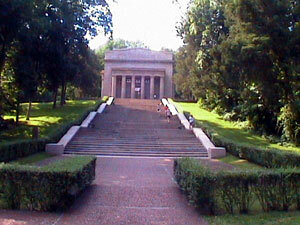 There is a large memorial to Lincoln with 56 steps leading up to the building, one step for each year of his life. 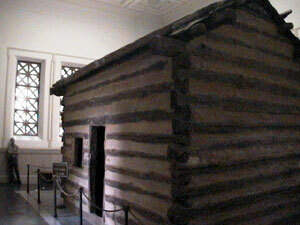 Inside the memorial building is the original cabin that Lincoln was born in. 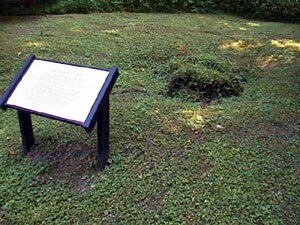 It measures 16 by 18 feet, had a dirt floor, and a small fireplace. 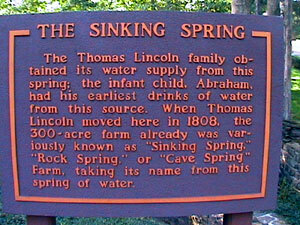 It's located just above Sinking Spring, a natural, clear flowing spring. I did my laundry today at a laundromat and got a flavor of the locals around here. They are a curious bunch. The jukebox in the laundromat only has country music in it and the people smoke like crazy. There were a number of kids who were bumming smokes off their parents and lighting up without a second thought. Just before I left a girl and her grandmother (I think) walked in and started doing their laundry. Just after they got the washers going the girl, who couldn't have been older than eight, pulled a pack of cigarettes out of her pocket and lit up. They call soda "pop" around here. It is nice to have a hotel again. Camping is a drag when I can't get a shower like last night. When it is really hot and humid it's very uncomfortable sleeping outside.